Black Friday looms over the horizon. Just ten days separates us from thousands of people waking before the crack of dawn to start loading their credit cards with merchandise that takes a year to be paid off. "great deal" pressures consumers into buying anyway. 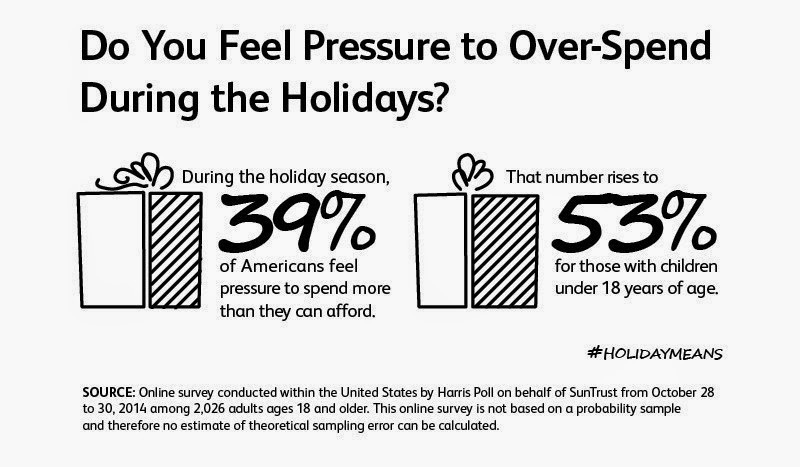 Atlanta-based SunTrust Bank commissioned a survey of 2,000 adults, and found nearly 40 percent of Americans feel pressured to spend more than they can afford during the holidays. Among parents with children under the age of 18, this pressure is even greater with 53 percent feeling pressured to over-spend, and 20 percent think they'll be paying one or more of their regular monthly bills – such as a utility or mortgage payment – late due to holiday expenditures. Across the country, 39 percent of consumers said they expect to spend as they go during the holiday shopping season and worry about the bill later. These findings seem to indicate the American consumer has all the ingredients for a big dish of financial stress in 2015. But it doesn't have to be that way. "Holidays should be less financially stressful and more meaningful," said Rilla Delorier, consumer channels executive at SunTrust Bank. "Our purpose at SunTrust is to help people achieve financial well-being, and that's especially hard to do this time of year. Through holidaymeans.com, we're showing people how they can think differently, spend thoughtfully and take specific steps to stay in financial control." To help people better manage holiday spending and avoid stress, SunTrust is offering tips, tools and advice on a website called holidaymeans.com. Resources will include a downloadable budget worksheet to track spending; planning guide with steps to achieve a stress-free holiday; ideas for creating holiday memories; inspirational videos; and posts from guest bloggers that offer advice for a meaningful holiday.